Everyone knows that person that gives back on the job or in the community. They are the ones that learned the secret of giving back and while they do this we watch their companies grow. Come to our March meetings and find out how going above and beyond you and your company can grow! Connie Ramos Williams is the Chief Marketing Officer, Founder, President at CONRIC PR & MARKETING. CONRIC PR & Marketing is recognized as one of the leading strategic branding, digital marketing, website development, advertising, and public relations agencies in Southwest Florida. It's the agency the Above Board Chamber of Florida and hundreds of local, regional and national companies turn to and trust for comprehensive marketing support that exceeds expectations and garners awards. For a free consultation contact Connie Ramos-Williams at 239-690-9840 or Connie@ConricPR.com, or visit ConricPR.com. Connie is a member of the Above Board Chamber of Florida. Gail Markham founded Markham Norton Mosteller Wright and Co. in 1979, and her area of focus is mediation, litigation services, and forensic accounting. She serves on boards and committees for several non-profit organizations, and provides guidance and support to other groups as well. Gail is the Founder of the Lee County PACE Center for Girls, and personally mentors young ladies on their paths to success. She has been recognized as an outstanding community leader on many occasions. 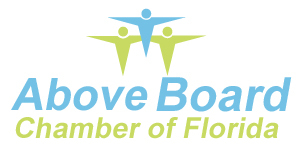 Gail is a member of the Above Board Chamber of Florida. Diana Willis, Owner of Jason's Deli of Southwest Florida, Diana is Vice President, of the Wilrock Group, LLC and it’s subsidiaries operating 6 Deli locations from Sarasota to Naples. Diana’s leadership exemplifies high ethical standards and integrity in her business and community. Her community involvement is vast over the past 19 years, for many non profits in the 5 counties their business serves. She is a Greater Fort Myers Chamber Women in Business Apex Ward recipient as well as Gulfshore Life Magazine’s Woman of the Year among her many awards. Marc Collins, Owner of Marc Collins Designs is a native of Athens, Alabama has lived in Ft. Myers for 22 years. Marc has had “Marc Collins Designs”, a residential and commercial interior design company for 24 years. The last 20 years Marc has focused on commercial hospitality design. Marc is very involved in numerous charitable organizations here in S. W. Florida, in raising both issue awareness and in fundraising for many organizations. Marc has been married to Lori Collins. Please RSVP for our Lee County meeting on top of this page on red link!